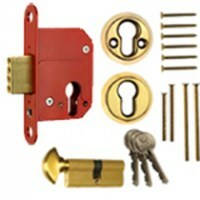 A mortice deadlock has a single 'dead' bolt that is locked or unlocked by the turn of a key from either side of a door. Deadlocks can be supplied keyed alike with the same key operating 2 or more locks. Dead locks are more commonly found on wooden door and are sometimes known as Chubb Locks.